After intercepting nerve gas being sold to terrorists, Impossible Mission Force agent Ethan Hunt (Tom Cruise) is convinced he can prove the existence of the Syndicate, an international criminal consortium. Reporting to an IMF substation to receive his next orders, Hunt is captured by the Syndicate, but escapes a torture chamber led by Syndicate member Janik "Bone Doctor" Vinter (Jens Hultén) with the help of disavowed MI6 agent and Syndicate operative Ilsa Faust (Rebecca Ferguson). Meanwhile, CIA director Alan Hunley (Alec Baldwin) and IMF agent William Brandt (Jeremy Renner) appear before a Senate oversight committee, and Hunley succeeds in having the IMF disbanded and absorbed into the CIA, boasting that Hunt will be captured within 24 hours. Cut off from the IMF, Hunt starts following his only lead: a blond man in glasses, later identified as Solomon Lane (Sean Harris). Six months later, Hunt remains on the run. Unable to find the Syndicate without help, he enlists former colleague Benji Dunn (Simon Pegg), arranging for him to attend the opera Turandot in Vienna to search for Lane, whom he suspects is the Syndicate's leader. Despite stopping three shooters including Faust, the Austrian Chancellor is killed by a car bomb. Brandt recruits former agent Luther Stickell (Ving Rhames) to find Hunt and prevent Hunley's team from killing him. Using a likeness of Faust left by Hunt, Brandt and Stickell are able to track Hunt, Dunn, and Faust to Morocco, where the three are infiltrating a secure underwater server beneath a power station. After having stolen what they believe to be a ledger containing the names of all Syndicate agents, Faust takes the drive and a chase ensues involving Ethan, his group, the Syndicate members, and Faust. Faust escapes, but Dunn reveals he had already made a copy of the data. 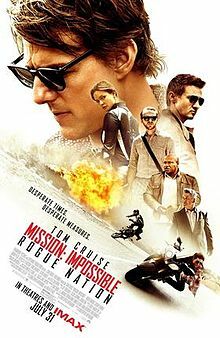 This movie was filled with non-stop actions except for some dialogues, but overall, it was fast-paced, thrilling suspense with a little of comedy. Entertaining and worthwhile to watch it in the cinema. Loved that Tom Cruise did his own stunts which gave the movie the edge albeit a little dramatic at times. Other than that, the plot was basically a cat and mouse chase but with all the gimmicks and big budget, it turned out real nice. Great casts too with great moves and acting skills.